A blog from Rugby World reader, David Bateman. What’s your view? Scotland commence their Six Nations campaign against France this weekend, hoping to overcome much favoured opposition and thereby win in Paris for the first time since 1999. For their quest, Scotland coach Andy Robinson has named a mostly familiar side, with some modest changes. Captain Alastair Kellock returns to lock, forcing a reorganisation of the pack, with Nathan Hines to blind-side flanker, Kelly Brown to number eight and Richie Vernon relegated to the bench. Richie Gray will feature alongside Kellock at lock. The Killer B’s back-row of Kelly Brown, John Barclay and Johnny Beattie, who emerged as a prominent force in last year’s Six Nations, will have to wait to be re-united, as Beattie lacks the match practice to feature in the squad at this stage, having missed the Autumn internationals with injury. The Scotland pack is at full strength, with the exception of Beattie’s omission. 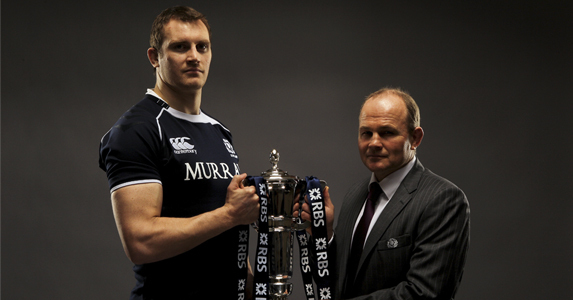 Although, they face a daunting task against the same pack that sealed last year’s Six Nations. The inclusion of the tenacious Hines points to the need to match the French pack’s physicality, also shown by the choice of Kellock and Gray at lock, standing 6ft 9 and 6ft 10 respectively. Although they hold a distinct height advantage over the French locks Julien Pierre and Lionel Nallet, the line-out will still be a hotly contested affair. The scrum will be more one-sided in the French favour, unless Euan Murray is in first-rate form to aid Ross Ford and Allan Jacobsen cope against the more powerful French front row. Winning the battle of the forwards will be vital should Scotland hope to kick-start this Six Nations in better fashion than previous years. The Scots have not won their opening fixture since 2006, when they defeated the French 20-16 at Murrayfield. Andy Robinson has identified this problem, and organised a game against players from Glasgow, Edinburgh and Scottish club teams in an attempt to counteract Scotlands often slow start. In last year’s championship, Scotland played some fantastic rugby, only to lose possession at vital moments. With so much hinging on Scotland’s forwards performance, it is vital that Rory Lawson at scrum-half and Dan Parks at fly-half use any possession they obtain wisely. If Parks can continue his inspirational performances from last year’s tournament and ensure territorial advantage for Scotland, they stand a far better chance of upsetting the odds. Should the forwards manage to match the French, and Parks keep Scotland in the right half, the onus will fall to the wider backs to find a way to take their opportunities, something they have not excelled at in recent years. Charged with that task is Nick De Luca, standing in for the injured Graeme Morrison in a forced change. Partnering De Luca in the centre is Joe Ansbro, earning his first appearance in the Six Nations. The duo faces a daunting task in stopping the advances of Perpignan centre Maxime Mermoz, and converted winger Aurelien Rougerie. Further wide, Max Evans replaces Sean Lamont on the wing, with Nikki Walker and Hugo Southwell completing the back three. If given the opportunity, the trio must grasp it for Scotland to steal a victory against a French side that are favourites despite coming under heavy criticism for recent performances. It will be curious to see how France regroup after their 59-16 destruction by Australia in November. If they come into this match low on confidence, still licking their wounds from that defeat, this Scotland side has more than enough quality to inflict a similarly discouraging loss on them. Particularly the French forwards must be wary of a Scottish pack that goes to Paris ready for war. But, as is always the case with the French national rugby team, should they be in the right frame of mind, Scotland could suffer severe retaliation at the hands of a superior squad. It’s the beauty of the Six Nations opening game: no-one can really predict what is going to happen.